Before I married my farmer, or before I took a college class on Meat Science, I fully admit to being a little not so smart about the different cuts of meat. I didn’t know much about where they came from, the tenderness, the marbling, the color…I was indifferent, and everything can taste good with ketchup, right? Well, once I took a class on meat science my knowledge quickly expanded. And when I married my husband, who is a beef farmer, that knowledge came in really handy when it came time to take a steer to market and I needed to let him know what cuts I wanted out of that calf. Ohhh wow. Was I overwhelmed. 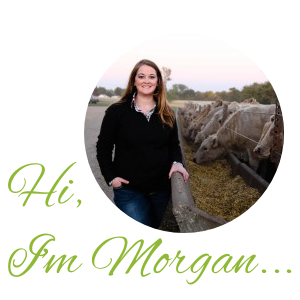 But, in the last five years I am proud to say my knowledge of the cuts of beef has expanded greatly and I have some pretty good recipes for all of our favorite cuts. Sometimes we sell our cattle locally and we often have the purchaser ask us what kinds of cuts we suggest for them to get. Now, he always hands me the phone or lets me answer the questions. That’s when I know he really trusts my opinions! This chart is from the Beef Checkoff. It’s a pretty valuable resource for consumers, as well as beef producers. They use funds from the sales of beef to increase consumer knowledge, encourage producers to sell more beef, and encourage consumers to buy more! I love this chart for the simple fact it’s simple. Real simple. 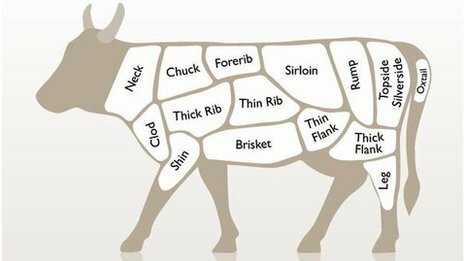 You can see the names of cuts you would buy in the grocery store, where they come from, and the best way of cooking them. Tenderness is a big part of what makes beef yummy. The most tender part on the beef is the filet. It’s also the smallest, yet most expensive on the menu at your local steak restaurant. It’s also the least worked muscle on the body. It is above the tail head, that’s why it is so tender! In the chart below it’s right in the middle of the sirloin and rump. When it comes to cooking the various cuts of meats there are typically two ways. Fast and dry or slow and moist. Your tougher cuts of meat you want to cook slow and make sure they are moist. Like roasts. We typically cook those for an extended amount of time and we cook them in water, beef broth, beer, etc. Roast typically come from the tough parts of the body like the legs, flanks, or brisket (My favorite!). The fast and dry method is usually used to cook steaks. We typically marinate them for a bit, but then take them out of the liquid and toss them on the grill or broil them in the oven. I cook a lot of beef around here and I am always looking for different ways to make it. But, I always find having charts on hand to double check are really helpful for me. Because sometimes there are so many it’s hard to remember all the recommended cooking methods for the various cuts. 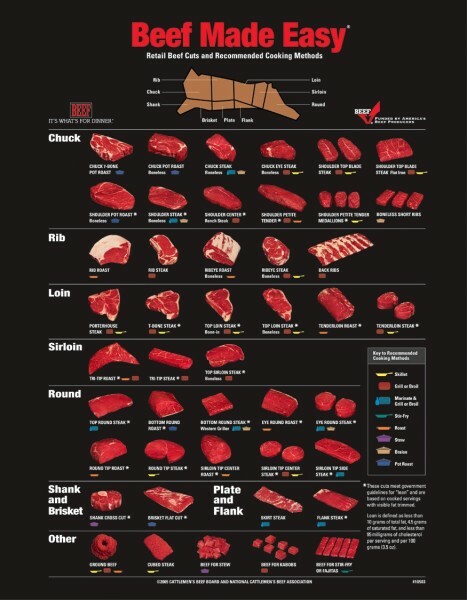 If you are interested in printing your own beef chart click here for the downloads from Beef. It’s a great resource to have and I just have mine thrown in with my recipes!